Address: 38 Benton Street, Hadleigh, Suffolk. Fred Harvey was born in Hadleigh in 1893. In 1901 at the age of 8 he was living with his grand parents, Abraham and Sarah on Benton Street. By 1911 he was living with his uncle Arthur and Aunty Emily at 38 Benton Street and at that time he was working as a shop assistant in a clothing shop. He seems to have responded to Lord Kitchener's appeal for recruits, as the 7 Battalion the Suffolk Regiment were part of Kitchener's first New Army (K1). 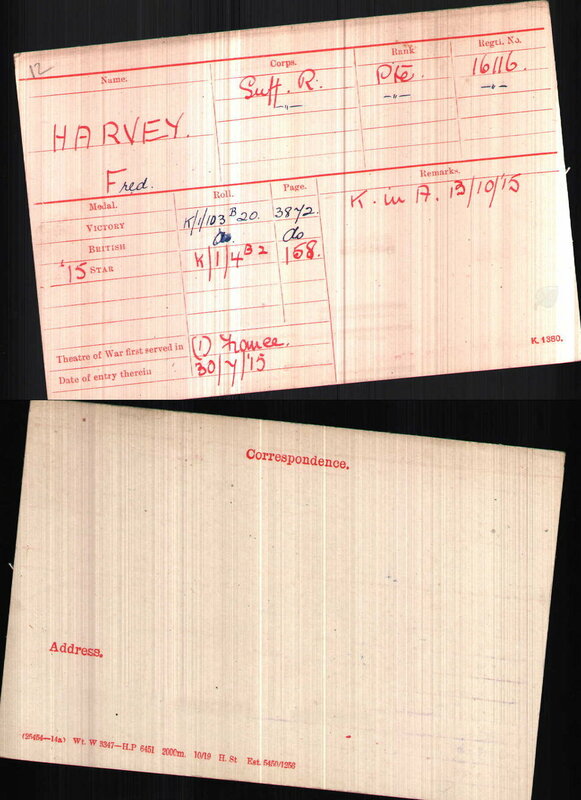 Private Frederick Harvey joined his battalion in France on 30 July 1915. The 7 Bn Suffolk Regiment were part of the 12 (Eastern) Division who by the start of October 1915 had been sent to the Loos area to relieve the 1st & 2nd Guards Divisions. The Battle of Loos began on 25 September with ‘The Big Push’, a planned offensive to take place over a broad front between Le Bassée and the mining town of Loos in northern France. After 2 days of intense fighting, the Germans were driven from their front line trenches. The objective was then to hold the new position and continue the advance, bringing in reserve troops and taking out the wounded across what was no-man’s land. Here connecting trenches either hadn’t been dug or were woefully in adequate. The result was congestion and men moving across the battlefield were easily exposed to enemy fire. At noon on the 8 October 1915 German artillery opened a bombardment on the whole front between the La Bassee Canal and Lens, increasing in intensity at 3.00pm. At around 4.00pm, their infantry attacked between the Double Crassier and the Chalk Pit. On the Allied right, the shelling failed to sufficiently damage the French wire and the German attack was halted with heavy loss. At the same hour, enemy bombers attacked from the Quarries and Fosse 8 against the forward British positions in Quarry Trench and Big Willie. On the left of the Loos attack, the attack fell against the 2Bn Royal Munster Fusiliers, 1Bn Gloucesters and 1/9th King’s of 1st Division, between the Loos-Puits 14 bis track and North of the Chalk Pit. Despite heavy shellfire casualties among the defenders, British machine-guns destroyed the attack within 40 yards of the front line. On the Hohenzollern Redoubt front, the 2Bn Coldstream Guards repelled all attacks, as they were by now armed with many Mills bombs. The 3Bn Grenadier Guards were pushed back some way, but eventually formed a block and then counterattacked (supported by two companies of the 1Bn Scots Guards and the bombers of the Irish Guards) and recovered the lost trenches and caused heavy loss to the enemy. By 18:15hrs the 37th Brigade of 12th Division, led by 6Bn Royal West Kents, attacked against Gun Trench near Hulluch, but after gaining a footing in the trench had to retire due to lack of grenades. Private Frederick Harvey joined his battalion in France on 30 July 1915. His battalion was part of the 12 (Eastern) Division who between the 1 to 3 October 1915 were sent to relieve the 1st and 2nd Guards Brigades in area of the Chalk Pit. They were put to work on completing preparations of new trenches, roads and positions in preparation for an assault. Heavy enemy shelling caused many casualties among the working parties and the Divisional Commander, Major-General Wing was among those killed. The renewal of the British offensive is delayed until 6 October, to enable preparatory attacks on Fosse 8 and Hill 70 to take place. Following the loss of the trenches of Hohenzollern Redoubt, this area takes priority. The 12th Division and the Guards Division are ordered to capture the Quarries and the Fosse 8 / Hohenzollern respectively on 9th October. The 3Bn Grenadier Guards were pushed back some way, but eventually formed a block and then counterattacked (supported by two companies of the 1Bn Scots Guards and the bombers of the Irish Guards) and recovered the lost trenches and caused heavy loss to the enemy. By 18:15hrs the 37th Brigade of 12th Division, led by 6Bn Royal West Kents, attacked against Gun Trench near Hulluch, but after gaining a footing in the trench had to retire due to lack of grenades. From 9 to 13 October 1915 the British made preparations to renew the offensive. 3,170 new gas cylinders were installed in the forward positions facing the Hohenzollern Redoubt and Fosse 8 (although only 1,100 of them would actually be discharged on 13th October, as it turned out). On the night of 10th October, the 2Bn Grenadier Guards captured an enemy position called The Loop (a portion of communication trench near Big Willie from which they had been able to shoot down the Guards trenches), after heavy hand-to-hand fighting. An enemy counterattack the next day was beaten off, as was another on 12 October 1915. The 7Bn Suffolks and the 5Bn South Staffords were to relieve the Guards on the 12th, but this was delayed due to heavy German shell and mortar fire. By the 12 October 1915 it became clear that the French Tenth Army was unable to get beyond Vimy Ridge and so they were going to stand fast in their current positions. Therefore the distant objectives that had been given to the British on 18 September 1915 were no longer required. The British would however continue to attempt to secure the best ground to hold their position and be ready to renew the offensive when ordered. On 13 October 1915 on a bright, sunny day with an ideal wind for moving gas towards the enemy the British renewed their offensive. XI Corps orders were to recover the Quarries and Fosse 8; IV Corps were to consolidate the line of the Lens-La Bassée road between Chalk Pit Wood and the Vermelles-Hulluch road. 46th Division only completed its relief of the Guards Division in Big Willie at 6.00am due to congestion of the trenches and the confusion resulting from the enemy’s counter-attack. This Division, freshly arrived from Ypres, had no prior knowledge of the ground to be attacked. On first examination CO Major-General Stuart-Wortley wished to attack using bombers, gradually taking the position trench by trench. He was overruled by XI Corps HQ, and told to attack in the same way that 9th Division had on 25th September (which had largely succeeded but at a cost of more than 6,000 men). The heavy British bombardment opened up at noon. 54 heavy and 86 field howitzers, with 286 field guns, fired for two hours on enemy trenches in or approaching the Hohenzollern Redoubt, Fosse 8, the Quarries, Gun Trench and the positions south to Chalk Pit Wood. And the French shell German positions on Hill 70 and in Bois Hugo. It was to prove too light to do sufficient damage to the enemy positions. At 13:00hrs Gas and smoke are discharged on three fronts: South-West of Hulluch by 1st Division; between the Hohenzollern Redoubt and the Vermelles-Auchy road by 46th Division, and between the road and the canal by 2nd Division. The discharge continued until 14.00hrs, although the gas was to be stopped at 13:50hrs, giving the enemy ample evidence of an imminent infantry attack. A heavy German bombardment opens on the area occupied by 46th Division. At 14:00hrs the infantry attacked (although some units started a few minutes earlier). Led by 1st Brigade, the attack of 1st Division against 1400 yards of enemy positions along the Lens-La Bassée road between Loos and Hulluch was hit by fire of increasing intensity as they approached the German wire 300 yards away. They found that only four passages through the wire had been cleared by the bombardment and despite efforts to cut through, the attack was halted. The survivors withdrew after dark; the Divisions suffered 1,200 casualties in this fruitless assault. 37th and 35th Brigades of 12th (Eastern) Division attacked between Gun Trench and the Quarries. Although 7Bn East Surreys of 37th Brigade reached Gun Trench without too much trouble, on their left the 6Bn Buffs were shattered by fire from a previously unseen (and therefore not shelled) trench. This battalion lost over 400 men in a few minutes, barely advancing 100 yards before halting. 35th Brigade, led by 7Bn Norfolksand 7Bn Suffolks, found the smoke screen very thin, which allowed the enemy to fire across their advance from the direction of the Slag Alley as well as frontally. Although they gained a foothold in the Quarries, they could not press on but did consolidate the position. It was during this action that Private Fred Harvey was killed. Although minor fighting continued for some weeks after, by mid October the Battle of Loos was effectively over and both sides settled in to their new positions. The result was a gain to the British of a 7km front to a depth of nearly 4 km. The valuable French coal fields were still far from being captured and the losses largely due to wounds were 50,000 men and 2,000 officers. 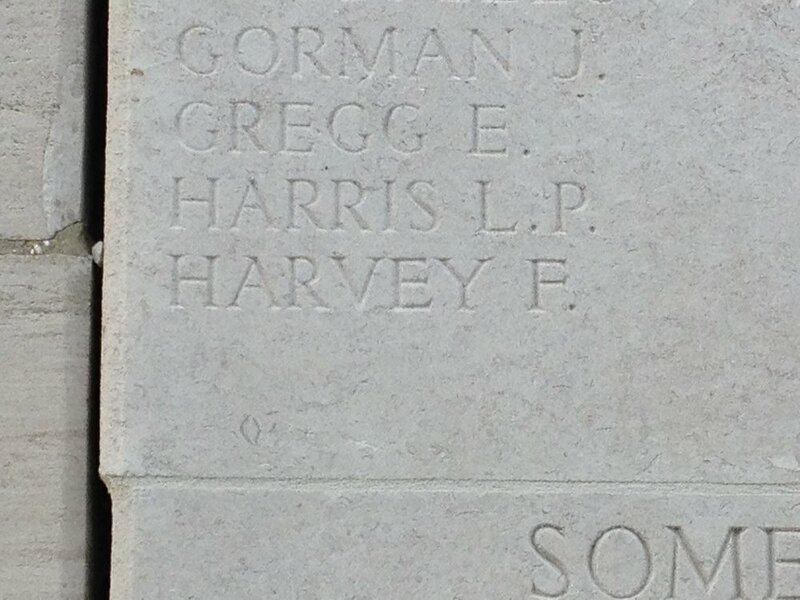 The body of Fred Harvey killed during the attack on the 13 October 1915 was subsequently lost on the battlefield and he is now remembered on the Loos Memorial to the Missing. We hope that this page has been able to tell the story of Private Fred Harvey. If you know of any information which might help to add to the story then please get in touch.